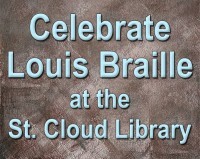 In commemoration of Louis Braille's birthday, Jan. 3, representatives from the Central Minnesota chapter of the National Federation of Blindness will be at the St. Cloud Public Library to talk about being blind in today's society, demonstrate technology that assists blind people, and show how to write and read Braille. The program will take place from 10:00 a.m. to 1:00 p.m. in the Array Community Room. It is free and open to the public. Braille was a pupil and then instructor at the National Institute for Blind Youth in Paris where, by 1837, he had developed the Braille system still used for reading by individuals who are blind.